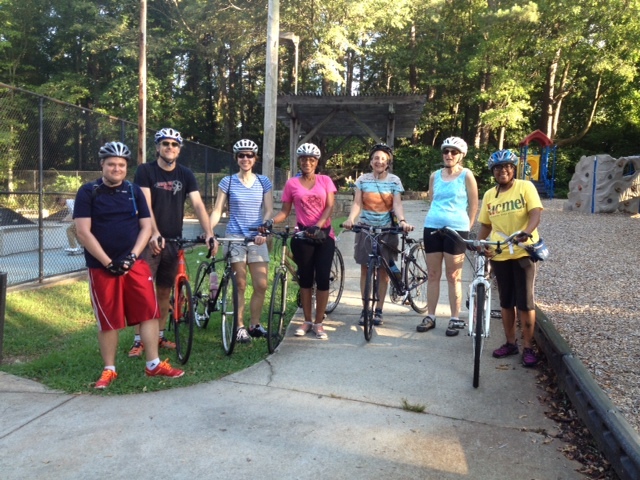 Let’s Bike Decatur! Friday, August 21……. Let’s Bike Decatur! This Friday, August 21 at 6:30 pm join Decatur Active Living for a fun, social and slow paced ride around historic/scenic Decatur. We will ride 5-6 miles and enjoy refreshments after the ride at one of Decatur’s watering holes. Make new friends and have fun riding around the City. Meet in front of the Decatur Recreation Center at 6:30 pm. We share the parking deck behind the Library, so there is plenty of parking if you are driving over. Fill up your tires and make minor adjustments with the Dero bike repair station out front. No ride if raining…check back here to see if the ride is cancelled due to inclement weather. Helmets are required, and bring water to drink!